This is the French weapons trials ship Ile D'Oleron (A610). Ile D'Oleron was a German naval auxiliary, originally named Mur, taken as a war prize. 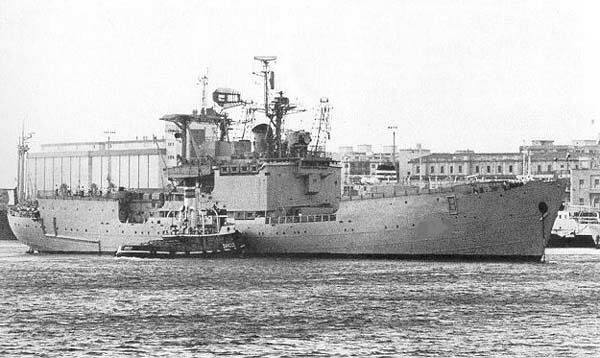 She was commissioned in the French navy in 1945 as a transport, then converted to a weapons trials ship in 1957-58. In that role she tested many new weapons and their associated electronics until she was finally discarded in 2000. Correct answers were received from: Per Nordenberg, Jørn Kiel Nielsen, Sergey Myagkov, Dave Shirlaw, Kenji Nozaki, Lance Kopplin, Bob Harmer, Antonio Doval, Florent Sornat, Siemon Wezeman, Jean-Yves Mages, Friedrich Kappes, Charles Cawood, Pat Barnhouse, Jean Lassaque, Dubois, Anthony Vella , Warren Cressman, Wolfgang Hopf, Carsten Larsen, James T. Flynn, Jr., Brooks A Rowlett, Espen Arnestad, Czéh György, Mazzoleni Michel, Yves Grangeon, Michael Erich Ludwig Engelbrecht, Michael R. Flora, Javier Hueso, Ed Schweikart, Jörg Bihlmayr, Johann-A hlert Bremer, Lars Scharff, Steve Levine, Wdonwicki Georges, Bill Rhodes, Sumihiro Sano, Tom Whalen, Ryszard Czyszkiewicz, Fabio Peña, Masaki Ogasawara, Stephen M. Willis, Luc Fournier, Marcantonio Papagni, Rick Heinbaugh, Sarasso Giovanni, Michele D'urzo , Jens Ratkowski, Rich Austin, Maurizio Brescia, Steve Langevin, Rob Locke, Greg Lof, Langry Wilfried, Hunt Lewis, William F. Fessenden, Paolo Marsan, Lars Eriksson, William H. Croft, John C. Janeczek, Aleksey Mikhaylov, Timo Herrala, Jouko K Lehmusto, Ba rry Gerrard, Nick L. Snyder, Nigel Isherwood, Dave Mallinson, Jim Woodward, Manuel Bernhard, Antoni Casinos, Carlo Bergamini, Bob Todd, Rick Lundin, Scandelli Luciano, Ian Evans, Werner L. Stunkel.